This entry was posted on January 1, 2013, 11:18 am and is filed under Bash Scripting, Raspberry Pi. You can follow any responses to this entry through RSS 2.0. You can leave a response, or trackback from your own site. I’ve been trying setting up motion properly, but when I try turning up the resolution to 640×480 I get terrible green lines in all my screen and it’s impossible to fix it because only works at the default motion resolution. I’m using a Creative LiveCam Sync HD, UVC and 720p HD resolution. Any idea about what I could do? I’ve tried (2) Logitech cameras and (1) Microsoft camera on (2) RaspPi’s and (2) Operating Systems. I have not been able to get an image bigger than 358 x 288 pixels, not matter how much compression I use. It works perfect at a smaller size, but at 640 x 480 pixels, I get similar results to you or no results at all. The cameras are all capable of it. I also noticed some permissions problems I had with the ‘motion.conf’ file and the ‘/tmp/motion’ directory, which I fixed and need to add to my post (see output below). > Did one of you guys already solve that? I set this up following your directions on my Raspberry Pi and my Logitech camera. It works great on Chrome over the web from a PC, but on iPhone or other Apple devices it doesn’t refresh. You show your MJPEG stream on your iphone. Do the photos update when you view it on the iphone? My Safari only shows the first image when I enter the URL and then never updates. If I stop the page and reload, I get 1 more image. If I install “CCTV Lite” or another MJPEG stream viewing app, then I can connect to my motion server but not directly from the web browser on the phone like I can on the PC. Any ideas? Thanks for the feedback. I haven’t had a lot of luck getting enough performance out of the Raspberry Pi with motion to be really useful. The resolution definitely needs to be very low. If it goes much about 352 x 288 then it doesn’t display at all and I need to keep the frame rate at 1 or 2 per second. Saving videos has not worked for me at all so I just use it as an IP webcam that I can view online to check in things. Thanks for the nice instructions to get me started with the Pi and Motion. Are you able to drive two webcam from a single Raspberry pi ? For some reason it works fine with single webcam but not with 2 webcams. I have not tried. 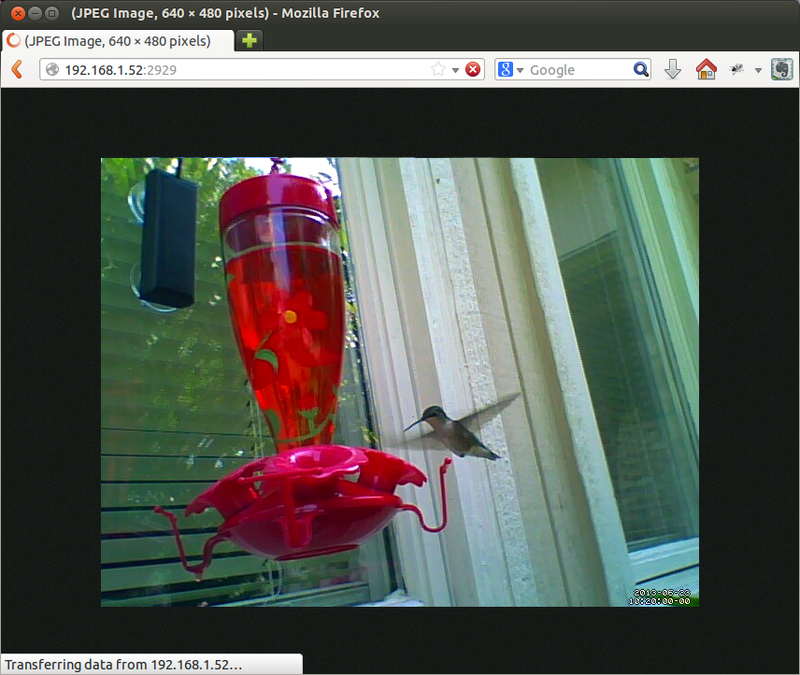 I had such slow results with one webcam, I would be surprised if the RPi could handle both. Just an update. I have tried motion with two cameras by connecting through ethernet port for internet connectivity instead of wifi dongle and it works great. I have followed all the installation instructions. Now I want to execute a python program which sends the snapshot to my remote database and save it as a blob. I have written the python script although when user ‘motion’ executes as a daemon some permission issues dont let the python script open the file. But if I manually run the motion software from root user. It works fine. I am looking for a way to automate this, the permissions are the only issue in this. Hi, and thanks for the tutorial, could you please explain or write out how to config. multiple cams? I have enabled the additional threads, and the thread.conf files correctly and know all 3 cameras are live and can output. I think the problem is that I cannot get Motion to run more than 1 thread. How do I get the Pi to run all 4 motion threads (3 cameras+motion.conf).Can you help please? Thanks for sharing this. I had the same problem when resizing the image.But still managed to work with 640*480. Great tutorial. has anyone tried using the area_detect option it doesn’t seem to work for me. Very nice. Will this setup work with the Raspberry Pi camera board? You may want to use a dyndns account to get rid of the problem not to know your dynamic IP address. All in all a good desciption that halped my a lot. Thank you! Thank you for advice. I will try that. It will be kind of you to help me. Hi Gary. Amazing article, thanks for this. I’m wondering though.. When I view my cam – it seems to be constantly streaming new JPEGs (I see the timer changing every second on the camera feed), even when no motion is detected. Is this normal? I believe that is right, but only the motion images (frames) are saved to disk. Look at the Live Webcam Server section of the configuration. Where does the images saved once they are captured? is it on the Memory card itself? If so is there a way to have them saved on a USB Drive or a NAS Drive please? Good question. I don’t think so. The camera needs Motion running to detect. Motion needs the OS running. The camera needs power all the time, which it gets from the RPi. Imaging is pretty processor intensive. Funny I was thinking the same thing – a PIR sensor, but figured it would also require power from the pi. If you could find a sensor with its own source of power supply Maybe? however a PIR sensor with its own power supply would be a good idea for a battery operated solution, if the wake time of the Pi would be short enough to (video) capture the moving target. You asked: So what is the external address of my network? I configured xmail on my Raspberry Pi and used a script named ipaddrcheck.sh which runs every hour. It sends me an email whenever the ip-address changed. I’ve found it only works in certain browser’s. Hey Gary, I have been trying to set up motion with a mysql database running on the raspberry pi with no luck. Any guides I have seen online make reference to the configure file which I cannot find. I have added the mysql database details to the motion.conf file but it has not made any difference. I was wondering if you have managed to get this working? How can we determine if motion is built with MYSQL ? I’m working in a webcam surveillance with the Raspberry Pi and I’ve had some problems running the webcam on the internet. I can see the webcam on the internet but only for a couple of seconds and then I lost image. Thanks a lot on helping to solve a motion issues in the monitoring, its working very effectively in my monitors. i have problem to connect motion to mysql and insert data picture snapshoot to database. can you help me please?? Hello , I follow all the driving , but when I connect to my address 192.168.0.134:8081 screen appears webcam but all gray with the following message : “Unable to open video device”. how do I fix ? Thanks!!! Using the Raspberry Pi for something other than XBMC?